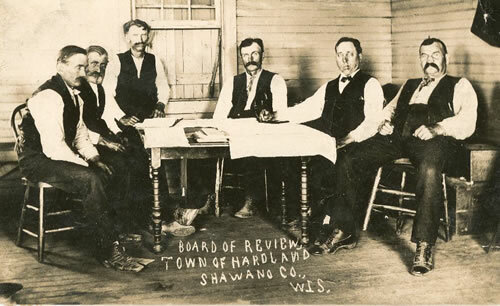 On December 10, 1859 the Shawano County Board of Supervisors organized the township of Hartland. The first official township meeting was held in the home of John Parks, at which time the first officers were elected. On May 20, 1862, President Abraham Lincoln signed a Homestead Act that pertained to Wisconsin and a few other states. This act gave 160 acres to anyone “who settled upon a tract to which no adverse title or claim exists, erects a habitation and lives on it for five years. He has to pay for the papers and legal formalities; requiring about $20 in all”. This gift of free land created a tremendous incentive for people to emigrate from other countries, or to move to other states or territories where this act applied. The Civil War created an incentive for establishing a post office for the residents of the Town of Hartland. In 1864 Charles Sumnicht took the initiative to contact the Federal Postal Service to set this up. It was stated that the primary reason for having a post office at the time was to get letters back and forth from and to the local residents serving in the Civil War. Mr. Sumnicht became the first postmaster. As he lived just west of Bonduel on the Military Road (Co. Hwy BE), his home became the post office, as it was easy for the stagecoach to drop off mail. Mr. Sumnicht resigned this post right after the war ended. Delos Krake then became postmaster and since his residence was also on Military Road, the Krake home became the post office. It should be noted that the village did not het have an official name in 1864. Some of the early news articles made reference to the village as Hartland Corners. When the application was made out for establishing the post office, the Federal Postal Department stated that Mr. Sumnicht could not use the ‘Hartland’ name as that village name was already used in Wisconsin. After looking at an early local surveyor map, Sumnicht noted that the name of Father Bonduel was written next to the Shioc River. Father Bonduel camped overnight in a shelter on the nearby Shioc River on his way back and forth between Green Bay and Menominee. So as a result of establishing a post office and a note on a surveyor’s map, Bonduel got its name. The Town of Hartland governed the village of Bonduel until 1916 when it officially became incorporated as a village. 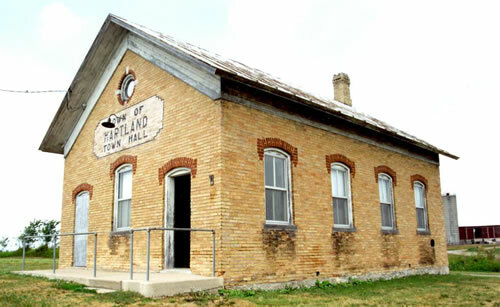 In the beginning years, the Town of Hartland’s Supervisory Board met and conducted their legal affairs in the homes of their officials or in the District #1 log school building located in Bonduel at the intersection of Green Bay and Appleton Road on the SE corner. On April 5, 1892 it was resolved to build a town hall on property purchased from Delos Krake on South Highline Road just south of County Road BE. Byron Fullerton of the Hartland Mill in Slab City was contracted to provide the lumber and build the hall for $377. This wood frame building was located very close to the road. By the spring of 1893 the board was occupying the hall. After the Sohr School building was vacated in 1944, an opportunity was created to use the building as the town hall. However, this did not take place until 1953 after board approval. The voting booths, lamps, benches, chairs and tables were then moved to the vacated school building. The old hall was then sold to Emery Herman who tore it down for the lumber. In the year 2000, a building committee was formed to address the need for a larger town hall. The current town hall property was too small to meet code for a new well and septic tank and was not large enough to provide the required parking space. 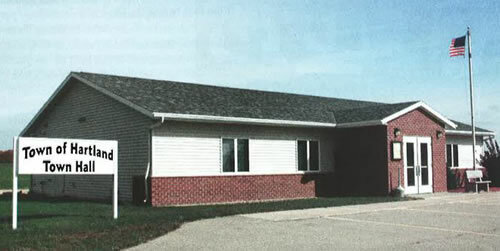 After addressing several options, it was decided to expand the existing area and in 2001 a larger town hall was built adjacent to the old hall on land purchased from Frank Heller Sr. The first meeting conducted at the new hall was in January of 2002. An ‘Open House’ was held on October 12, 2002. The new hall is rented out to local organizations and private individuals thus providing the town with its own community center. The information found on this page is only a small portion of the Town of Hartland’s history. To celebrate its Sesquicentennial in 2009, a book called ‘HARTLAND ROOTS’ was compiled and written by Darlene Heller, Bonduel Community Archive Director, Shawano County Historical Society. The book includes numerous pictures and articles that cover many aspects of the Town of Hartland and the early days of Bonduel. A copy of HARTLAND ROOTS can be purchased for $20 by contacting the Hartland Town Clerk, Susan Krull at (715) 851-1116 or the Shawano County Historical Society. See information below. The Shawano County Historical Society stores both hardcopy and electronic copies of donor files used to create the Hartland Roots book. It also has scanned images or copies of all the farm and family photographs submitted by Hartland residents during the search to collect Hartland’s history. Reprints are available by visiting or contacting the Shawano County Historical Society.